Please join me in welcoming the award-winning contemporary romance author, Melinda Curtis to Conversations today! Melinda is here to talk about her sweet romance, The Christmas Promise, part of the fourteen author, Sweet Christmas Kisses collection. 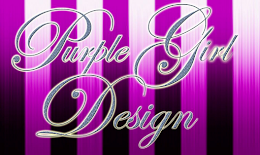 So be sure and check out the cover and blurb below! And be sure and check out her story behind the story of The Christmas Promise too! Plus, Melinda has a special gift just for you, a FREE digital copy of her sweet, fun novella set within the Hollywood Rules world. 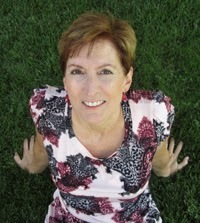 All you have to do is sign up for Melinda’s book release email newsletter HERE. Sweet Christmas Kisses takes you from small-town USA to England, Scotland, and even Ecuador; from the beach to snow-capped mountains, and to the wild--sometimes magical--west. 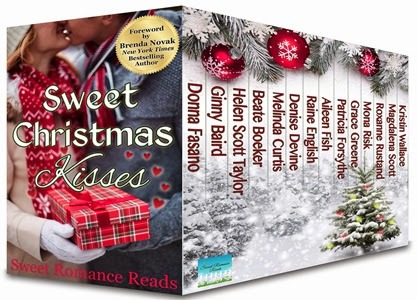 The Sweet Christmas Kisses bundle will bring you laughter, tears, and always joy, for more than 1600 pages. When a chocolate heiress bumps into a wounded warrior during Christmas, chaos ensues thanks in part to three fairy godmothers...er, a trio of meddlesome nuns. In June, I was asked to participate in a holiday anthology with 13 other sweet romance writers. Last year, I would have jumped up and down for joy. This year, I have 6 writing projects on the table and had deadlines that couldn’t be adjusted. Call me Crazy…I agreed. Only one problem besides squeezing it in the schedule: I needed an idea. At the time, my friend, Kim, was in Ecuador researching a new cocoa product (translation: she wanted to create a new chocolate snack organically). Kim was in a very remote part of Ecuador and her weekly updates to friends fascinated me. All the things we take for granted – a bug-free home, air conditioning, internet – she didn’t have any of that. One week, she reported the humongous size of bugs that landed on her, a snake sighting, and a trip from the cocoa fields uphill in the rain with a flat tire on her wheelbarrow. For a romantic comedy writer, it was nirvana! A fish out of water story was born! Add a wounded warrior, three matchmaking nuns, and I had myself a story. It turned out kind of like a cross between Runaway Bride and Romancing the Stone. Tiffany Bonander tried humming a few bars of White Christmas. It was, after all, December 23. Cheer was called for. But the incessant beat of fat raindrops on the tangled foliage of the Ecuadorian rainforest and on her pink rain slicker, drowned out her cheer. Or maybe she was just drowning under the pressure of heavy responsibilities. Ankle-deep water rushed down the steep, muddy road toward Tiff and her precious cargo–thirty pounds of cocoa beans. She couldn’t lose the beans. They were the answer to all her troubles. Thunder boomed. And boomed again. The downpour increased to a deluge. Tightening her grip on the wheelbarrow handles, Tiff tried to find purchase with her rain boots, tried to make it to the next rise before the road turned into a river. Tried…and failed. Somewhere above her the river had risen high enough to crest a bank. Water surged toward her. Tiff’s father claimed they’d abandoned this cocoa plantation years ago for drainage reasons. He should have used the F-word: flood. Tiff stumbled to her knees, and water rushed into her boots–cute, pink-flowered plastic ones which quickly filled with water and felt as heavy as cement shoes. If not for her grip on the wheelbarrow, she might have been swept downhill. Just last week, she’d heard about a woman who’d been carried away by the cresting river and smashed into a tree. Smashed as in: to pieces. Dead. That would be worse than being broke and the laughing-stock of the civilized world. This was karma, plain and simple. She shouldn’t have jilted Chad at their engagement party or left Malcolm at the altar. 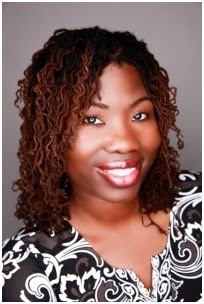 Please welcome AAMBookclub author Janet Autherine to Conversations today. Janet is here to talk about her new book, Growing into Greatness with God. So, check out the cover and blurb below! And don't forget to check out her interview too, and get to know Janet. Every child is created in the image of God, and every child carries this amazing gift of greatness inside himself or herself. But children hear mixed messages on a daily basis—about life, about the world, and about themselves. 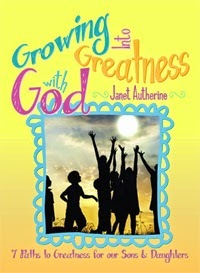 In Growing into Greatness with God: Seven Paths to Greatness for Our Sons and Daughters, author and mother of three boys Janet Autherine encourages kids to see themselves as unique and amazing—already blessed with what they need to succeed in life and achieve their dreams. Readers learn how to grow in love, faith, courage, leadership, happiness, gratitude, and confidence through the inspiring stories of Bible heroes such as Abraham, Sarah, David, and Ruth. Each chapter includes a brief summary of two Bible stories, with reflections on each, and concludes with three action-oriented suggestions on how to put the lesson into practice. The book ends with a letter that will inspire and empower readers, and questions for study and self-reflection that can be used by parents and teachers to help their children continue on their journey to greatness. Dreams are essential to life, and kids need to be inspired and encouraged to live life to the fullest. Growing into Greatness with God offers biblical examples of how people have nurtured what God has planted in them and teaches kids how to do the same in their own lives. What was the inspiration for your book, Growing into Greatness with God? In the book, Growing into Greatness with God, the words of wisdom that accompany the stories are inspired by all the advice given to me by my mothers, grandmothers, aunts, uncles, cousins and all the “old souls” that entered my early years. I grew up in a house where family, faith, good food and hard work were celebrated. A two bedroom house was home to three generations. It wasn’t unusual for an 11 year old to walk 1/2 mile to fetch water before school, walk home, get ready for school, walk at least 1/2 mile to school, be respectful and attentive, participate in field day, take the long walk home with friends (not forgetting to stop and say hello to all the neighbors), pick fruit or dig yams for dinner, complete homework assignments, and end the day by having dinner and fellowship with family. That was my daily life growing up in Jamaica. I didn’t fully appreciate it back then, but I certainly do now. I want children to have confidence in the fact that they are unique, amazing, born with greatness and can overcome any obstacle. What is your spiritual background? I gained my confidence in a little church in St. Thomas, Jamaica, called the Hampton Court Seventh Day Adventist church. That church was the cornerstone of the community and it was where I learned and recited bible scriptures, sung gospel songs and recited poetry. It is where I made some of my best childhood friends, picked cherries from the best cherry tree in town and listened to the sermons that inspired me to keep God the center of my life. Love the Lord God with all your heart and your neighbor as yourself is my guiding principle in life. My family currently worships at a beautiful Episcopal church in Florida. How does your new book, Growing into Greatness with God: 7 Paths to Greatness for our Sons & Daughters, relate to your spiritual journey? The book, Growing into Greatness with God, was born from those early bible study groups in church. The stories of young David (the boy who defeated the Giant), Daniel (a man who stood without fear among lions), Solomon (the wise king) and Ruth (the loyal friend), as well as many others, all resonated with me. We were too poor to afford the latest toys and there was no television in our home, so these characters became my heroes. We were poor but it didn’t define our lives; we were rich in love, faith and community, and we had big dreams. Your book is titled, Growing into Greatness with God. How do you define greatness? We are all unique beings, so greatness will mean something different to each person. I think greatness is finding your natural talent, fueling it with passion, planting it in well nourished soil, and toiling in the garden until it breaks through the earth and reaches for the stars. You must then use everything that you have achieved to serve others. Service is the heart of greatness; for me, there is no greatness without service. What do you think about the culture of bullying in our schools? It breaks my heart that fear instead of love is consuming some of our children. I say fear because most bullies are acting based on their own fears and insecurities. They seek to feel better about themselves by hurting others. When children feel whole on the inside, there is no need fill that void in their spirit by hurting others. Unfortunately, we cannot always protect our children from mean-spiritedness, but we can empower them with the knowledge that they are unique, their thoughts and feelings are important, that God is with them even when they feel alone and they can overcome any obstacle. I hope that in some small way Growing into Greatness with God can help children shine a positive light on themselves. How can parents use your book, Growing into Greatness with God, to inspire their children? As a parent, I know how helpful it is to have a book that sparks discussion with your children. Each chapter of the book offers stories, practical advice that kids can relate to, and actionable wisdom. As an example, the chapter, Growing in Love, teaches kids not to focus on their outward appearance but the love and beauty in their hearts. Kids are encouraged to identify the things that they love and to follow their dreams. Parents can help their children with the “action” items in the book, such as – perform an act of kindness for a stranger, write 3 things that you love about yourself or establish a pen-pal relationship with a child in another country. The book ends with 24 questions kids and their parents can answer together, or teachers in a classroom setting or bible study group can moderate. What challenges did you face as a student? In 1982, I moved from Jamaica to Philadelphia to live with my mother and my brothers. I had to adjust to a new country, a new household and the typical middle school anxieties. I was a shy, introverted child and I struggled to find my voice; it didn’t help that my voice had a very strong Jamaican accent. For many years, I didn’t speak up as much as I needed to – I feared saying the wrong words and getting into trouble; I feared being teased because of my accent; I wasn’t familiar with the sound of my own voice. Fortunately, my upbringing gave me a quiet confidence; I was raised to believe that I was a good person, a good student and that I could achieve anything if I was willing to work hard. This is why I believe that we should empower kids with the confidence to believe in themselves and their strengths at a very early age so that they can face any challenge. We are all on a journey to realize our dreams, what has been your path? I went to Murrell Dobbins High School, a vocational high school and followed the business track. With my typing and short-hand skills, I was prepared to be the best administrative support staff member in Philadelphia. That was my plan B. College was not an option for me; it was a requirement. I always knew that I was going and when my older brother, Mark, encouraged me to attend Penn State University, I jumped at the chance to follow in his footsteps. I connected with the Caribbean Student’s Association, joined a vibrant church and happily settled into life in Happy Valley. It was there that I discovered that, at heart, I was a peacemaker. I ditched my Business major and chose Labor and Industrial Relations, a choice that would lead me to law school at Boston College- I discovered that I wanted to help people solve problems and a legal education enabled me to do so. Writing is allowing me to share my journey with others. About 8 years into my legal career, I was blessed to be appointed as an Administrative Law Judge for the District of Columbia government. It was the dream job that allowed me to hear cases, issue decisions, and participate in mediating disputes. My voice was heard in the courtroom and in written decisions but in a quiet, substantive manner that would make any introvert happy. When you find that thing that you are passionate about, it frees you up to live a well-rounded life. I now spend my time raising my three boys, writing and reading inspirational books, practicing law, participating in religious and community life and running as often as I can. Growing into Greatness with God focuses on empowering children; what lasting message do you want to leave with children and parents who read this book? Growing into Greatness with God is about finding the unique talent that God has blessed you with, nourishing that skill and using it to be of service. My journey began in a small town in Jamaica and is being realized in the United States. It started with the wonderful bible stories that allowed me to believe that with God everything is possible. It began with the principles of faith, family, hard-work, community and bonding over good, healthy food. I hope that the book reflects those principles and that everything that I have learned on my journey, thus far, can help a child realize that he or she was born with greatness. I love to spread that message so when my schedule permits, I gladly speak to children’s organizations, non-profit organizations, and the children’s ministry at churches at no cost. Please do not hesitate to contact me. I would like every child to know that regardless of your circumstances, you can become all that God has ordained for your life. 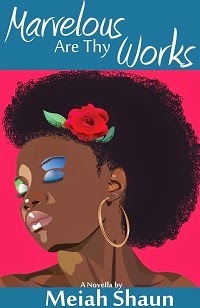 Autherine was born in St. Thomas, Jamaica, and immigrated to the United States when she was twelve. She grew up in Philadelphia and she went on to study at the Pennsylvania State University and Boston College Law School. After launching her law career, she was eventually drawn back to the sunshine, and she now lives in Florida with her husband and their three sons. Autherine continues to practice law, waking up at the crack of dawn to cultivate her writing. 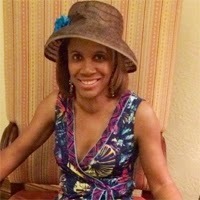 Her juvenile nonfiction book Growing into Greatness with God is inspired by her own experiences growing up in Jamaica and her goal of raising her sons to recognize and nourish what God has planted within each of them. 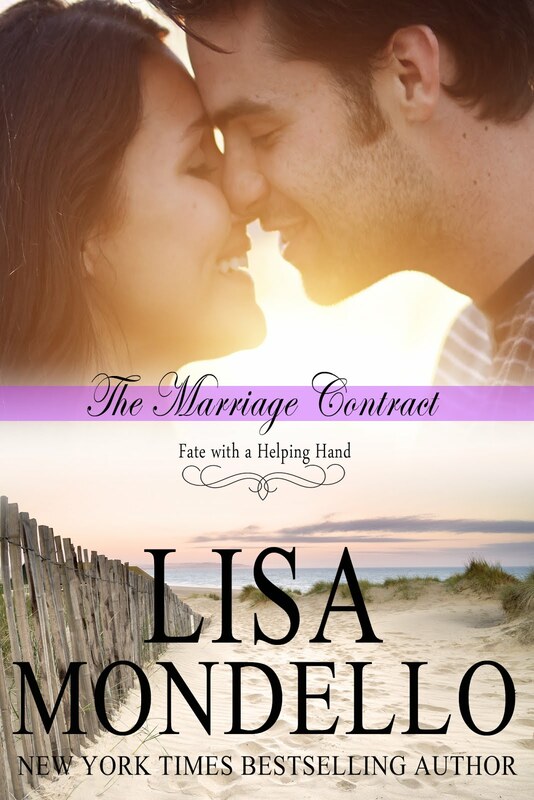 Please join me in welcoming contemporary romance author, Jael Friese to Conversations today! Jael is here to talk about her contemporary Western debut, Love Comes to Cookesville. So be sure and check out the cover and blurb below! Some people say, once you cross a line, you can never go back. No one believes that more than Jason Stuart who has been living on the edge of hell the past few years. 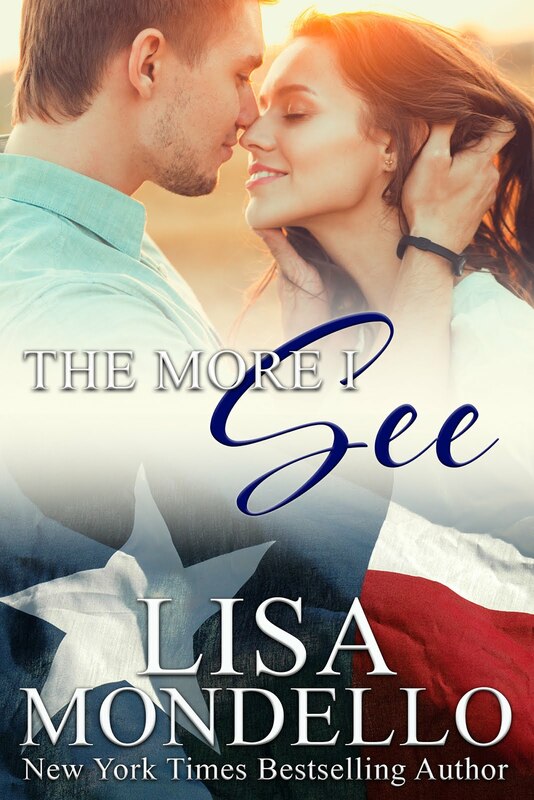 He's lost the only person who truly matters in his life: Shayla Cooke, who is leaving town with no intention of coming back. Some people say you can't run away from your problems. But that is exactly what Hope Welles needs to do, because if she doesn't, she might not have a future. 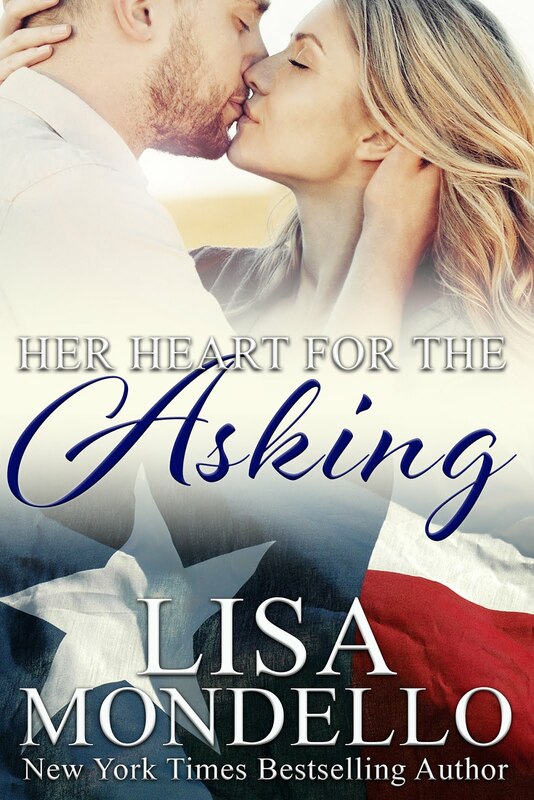 When she arrives in Arizona looking for her long-lost relatives, she comes across Wade Cooke who's been the social outcast for years. Just as Hope gives him a reason to believe his lonely days are behind him, he discovers things are never that easy. Jael Friese is just a daydreamer who started writing down her dreams. She writes contemporary. Her contemporary romance novels do have sexual content, mostly within marriage and mild language.She enjoys reading romance from Regency, historical, contemporary to paranormal.